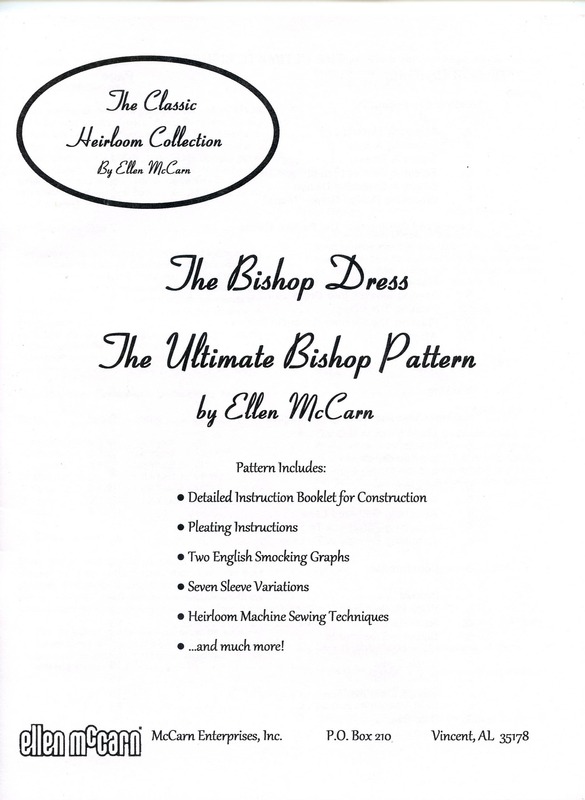 Almost every heirloom designer has a Bishop pattern, but Ellen McCarn's is unique. The hem of her design is straight across and the garment does not "hike up" under the arms as in other patterns. There is more fullness in the sleeve and a slight curve to the neckline which eliminates the dip in the front and back often seen in Bishop dresses. This additional fullness also decreases the tendency for a bishop neckline to "turtleneck"
There are sleeve variations for short, long or angel sleeves, insert collar, collar overlay, or front or back openings. A detailed, 24-page, step-by-step instruction booklet with over 150 illustrations, and a multi-sized smocking design are included. 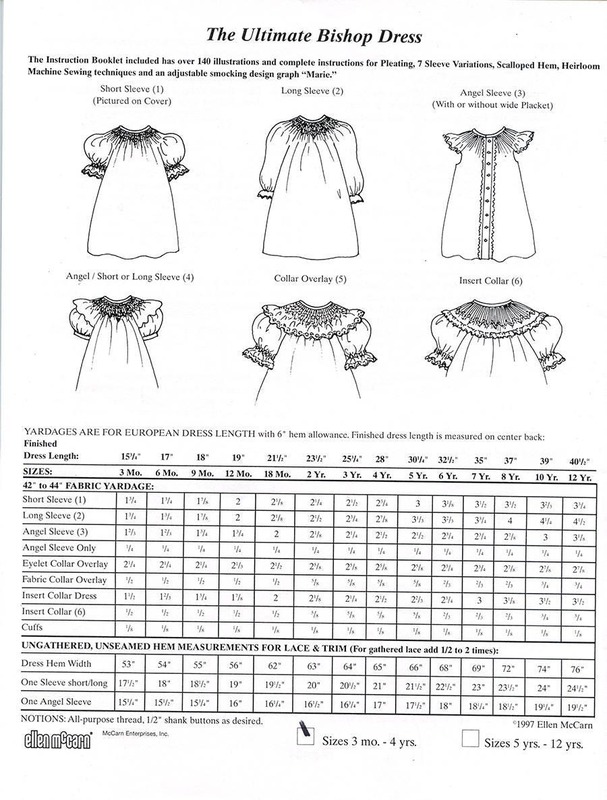 There are over 6 garment variations with instructions for each variation. There are even size charts for sleeve bands, neckbands and more. The instruction booklet is so good that I have even recommended buying the pattern just to get the instructions. NOTE: Be sure to check the yardage required for this dress. 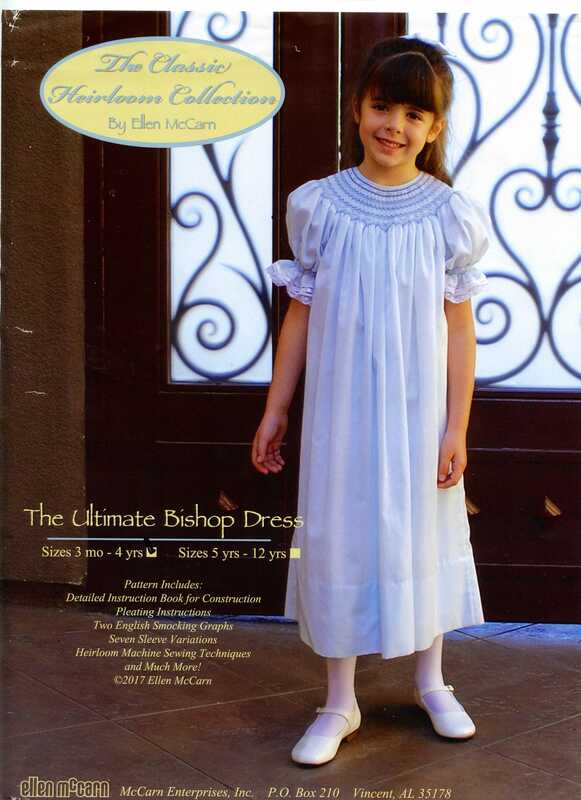 Because of the fullness it takes more fabric than other bishop patterns.